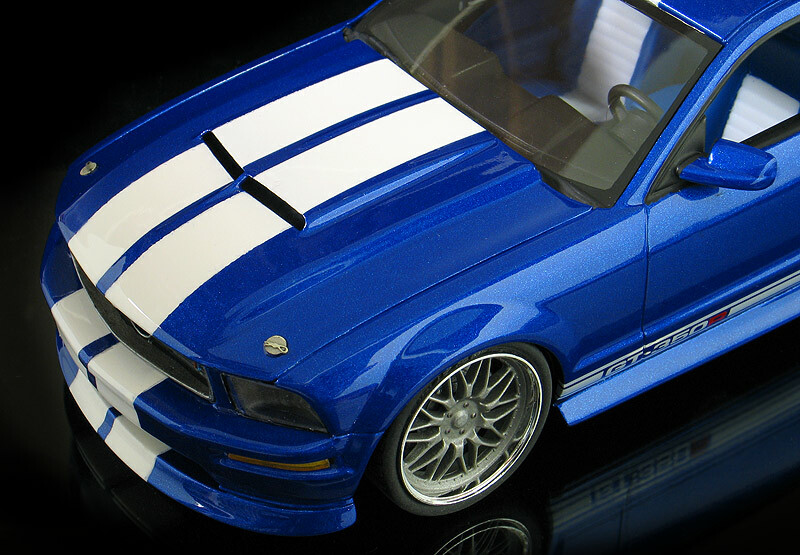 There have been so many cool versions of Ford Mustangs; Mach 1s, Bosses, Eleanor's, etc. 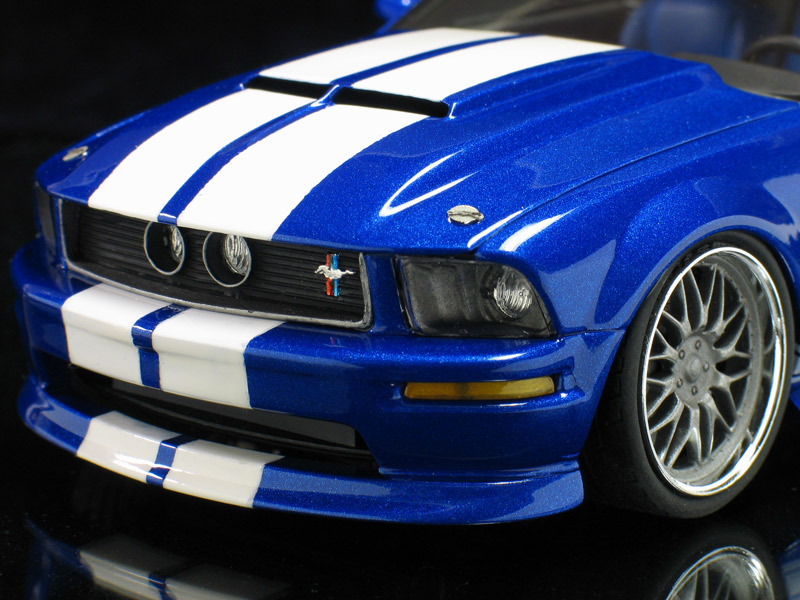 But, the kings of them all have to be the Shelby Mustangs. Originally designed as a secretary's car, Carroll Shelby stuffed the little Mustangs with a high-performance V-8 plus lots of go-fast parts and took them racing. One of my favorite Mustangs has always been the 1967 Shelby GT-350. 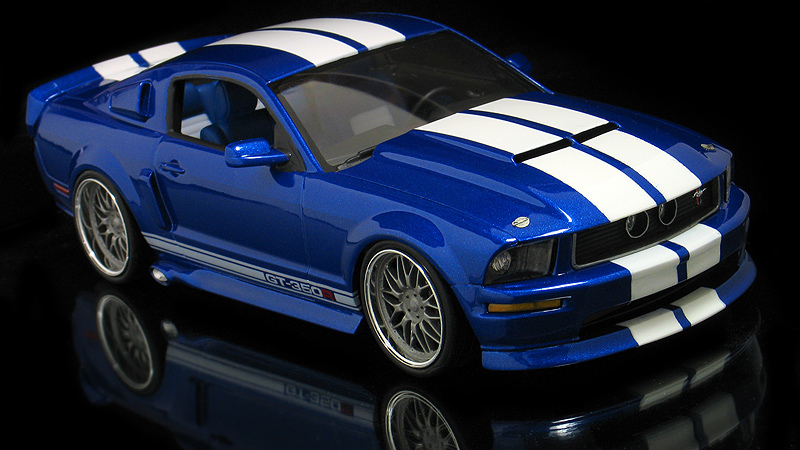 Carroll Shelby left the Ford clan in 1970 but he would eventually return in 2006. 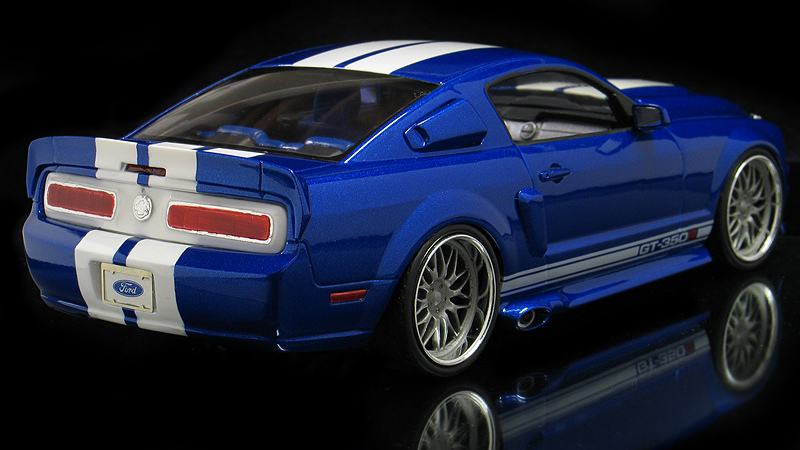 I love the current bodied Mustangs too and wanted to build my own pro-touring custom version of a modern Shelby inspired by the '67 GT-350. Ready to hit the track with it's road racing style stance, I call it... 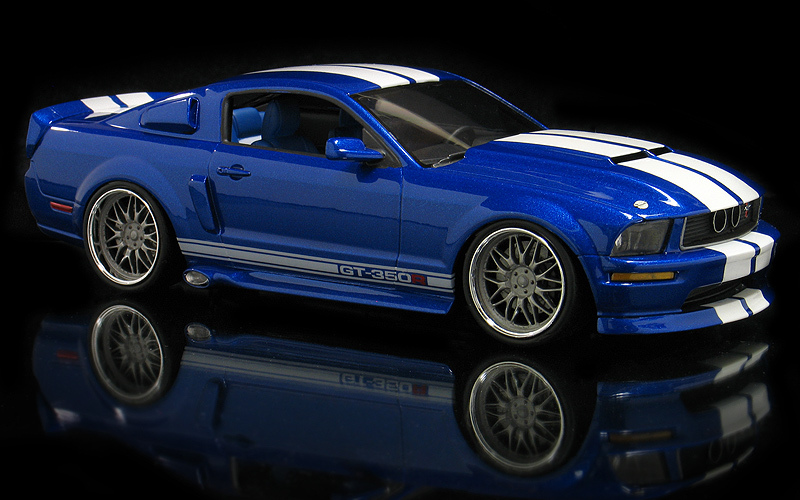 The GT-350R Super Shelby. 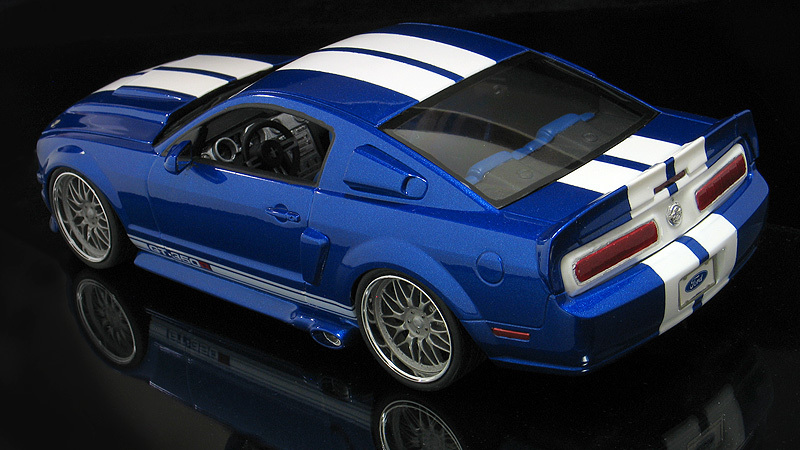 Although Revell has made several different Shelby Mustang kits I started my build from the more humble stock 2005 Mustang GT kit. 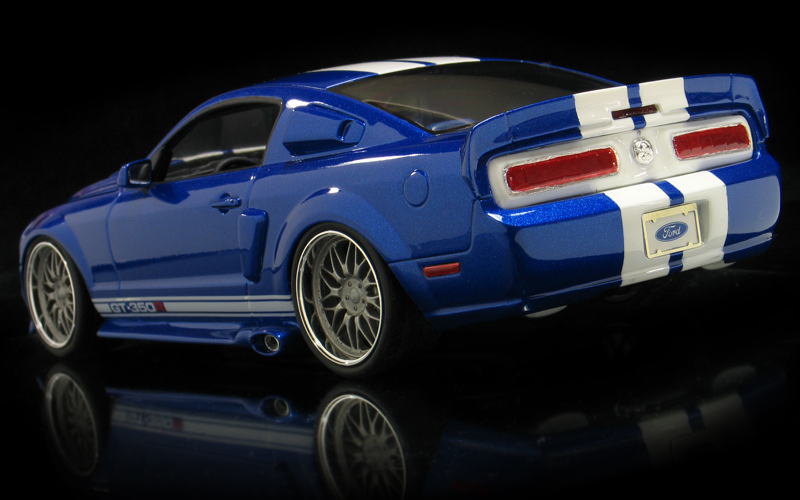 To this I added an 11-piece resin trans-kit which transformed my little 'Stang into a mean muscle machine. 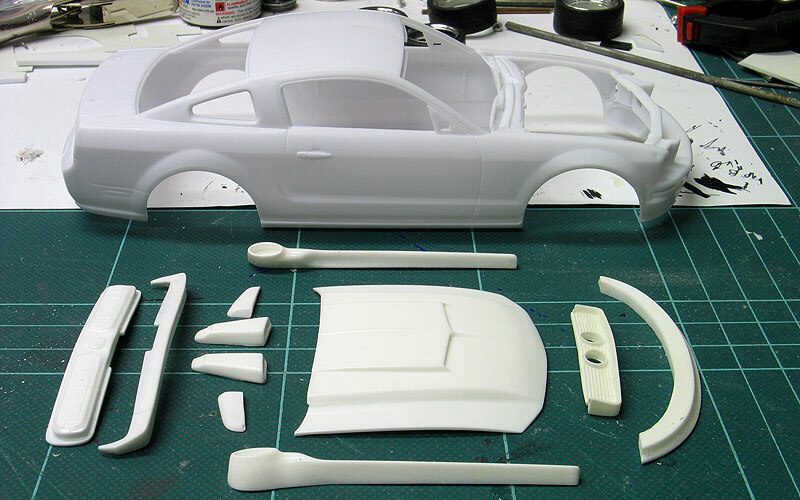 The resin kit was made by AF/X Resins and consisted of a '67 style Shelby hood, '67 style tail light panel, '67 style front grill with dual road lights, upper and lower side scoops, side exhaust skirts, front spoiler and a wrap around rear spoiler. It was a pretty decent kit but needed a little bit of adjusting to make everything fit right. 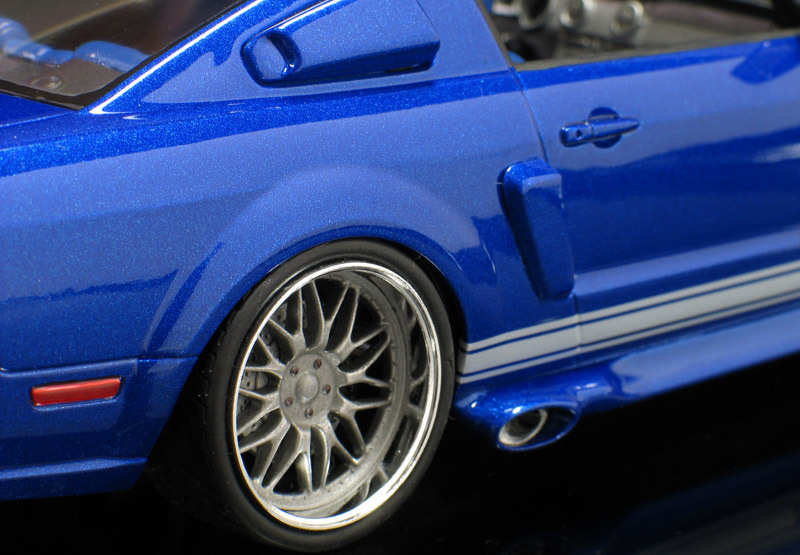 The biggest change I made was thinning down the back side of the side skirts so that they matched up to the front spoiler better. The front spoiler got a little tweaking too. I also ground out the under side of the resin hood and opened up the hood scoop. The kit also comes with a '67 style rear tail light panel which required removing the '05 tail lights with a Dremel tool. 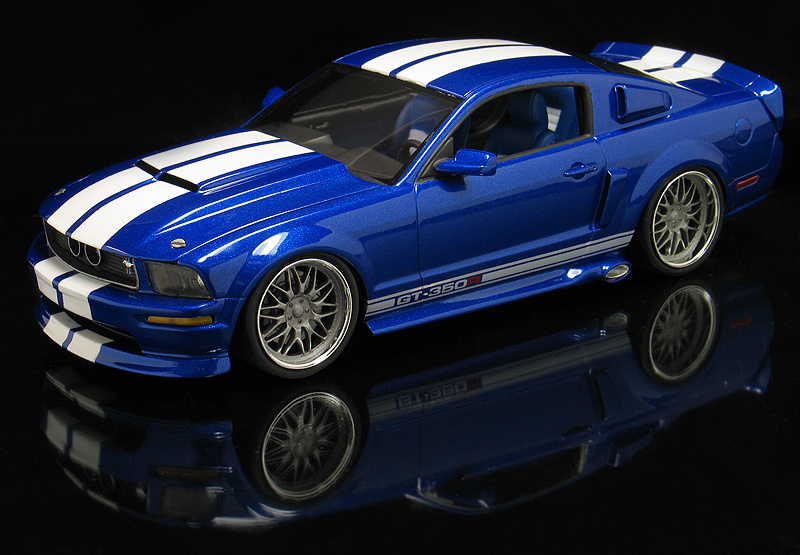 After the body mods were completed I painted the car Testors Viper GTS blue pearl with a set of white Shelby stripes. I also created a one-off set of GT-350R decals for the body sides and had my friend Dave Van print them in white on his Alps printer. After the paint work was all done I covered everything in a coat of PPG urethane clear. 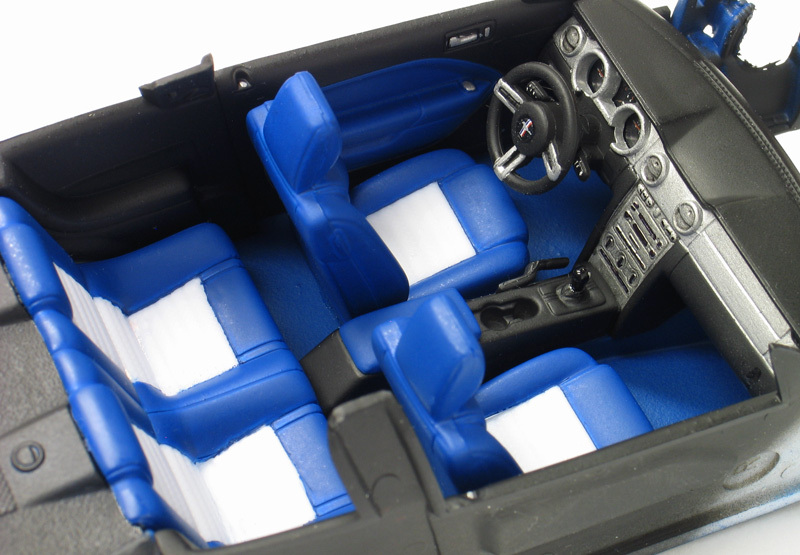 The interior is right out of the box but features lots of detail paint work. The chassis was also extensively modified so that I could get the stance I wanted. The wheels and tires are Pegasus Hobbies Virage BBS style rims, but I modified the centers of each wheel so they would have a deeper offset. The centers were then painted Model Master titanium gray. Other mods include Pro-Tech (PTMC 6) photo-etch hood pins and Pro-Tech (PITMC15) license plate frames from Pro-Tech. These are really nice parts and very easy to work with.